Name badges create a first impression so make it count! It's your chance to engage your audience and enhance your brand. Your logo and personalization are engraved into 2 ply plastic, available in an array of styles and color combinations. This process allows for clear solid color imprinting on a variety of colored plastics. 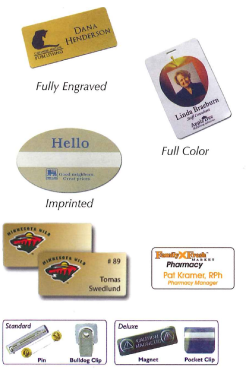 The vivid colors of a full color name badge leave a great impression. Images are reproduced with photographic quality. All name badges are available with your choice of pin, bulldog/swivel clip, magnet or pocket clip fasteners.